Boston : Houghton Mifflin Harcourt, 2017. I wasn’t particularly interested in 20th century poetry before I picked this up, but I was fascinated and even deeply moved by Marshall’s two earlier biographies of 19th century women involved in New England’s Transcendentalist movement, so I hoped I would enjoy this one too. I did. 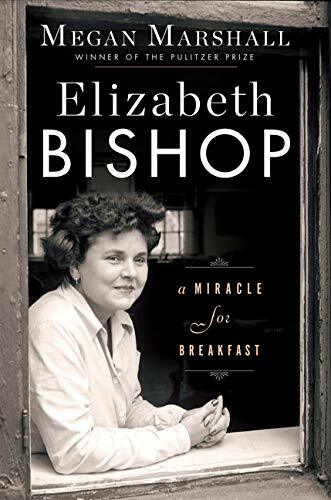 I found Elizabeth Bishop: A Miracle for Breakfast just as compelling as Marshall’s books on Margaret Fuller and the Peabody sisters, and as an added bonus it’s given me an unexpected newfound love of poetry. The poem referenced in the subtitle, A Miracle for Breakfast, is reprinted in the early pages of this book. Its unusual (to me) sestina form works well with Bishop’s self reflective poetry, and the poem intrigued and charmed me. I flipped back to it many times as I was reading. Using a poetic touch herself, Marshall has titled each chapter on Bishop with one of the six words that end the lines of each stanza of the poem. Elizabeth Bishop lost her parents early and loved women rather than men in a time that frowned on that, so she had her share of difficulties, but from a young age she was drawn to poetry. She became well connected in the literary world, knowing Mary McCarthy, Robert Lowell, Robert Fitzgerald and many other authors of her era, which broadens the scope and adds to the interest of this book. Bishop lived in a variety of environments, beginning her life in a small village in Canada then becoming established in the United States. But I especially enjoyed reading about her life in Brazil, in part because Bishop was more adventuresome than I expected. Marshall was a student of Elizabeth Bishop in the 1970’s, and while this book is mostly a biography, at the end of each Bishop chapter there is a brief but just as engrossing memoir chapter recounting Marshall’s life as a somewhat troubled but earnest college student and budding poet. The well balanced blend of biography and memoir is somewhat reminiscent of My Life in Middlemarch by Rebecca Mead, another wonderful book. Megan Marshall begins her biography of her former Harvard "verse-writing" instructor, poet Elizabeth Bishop (1911-1979), with an intriguing admission: Marshall has "reason to think that [Bishop] might dislike me" (p. 3). My curiosity about this unexpected statement kept me reading this relatively short but dense literary biography. In alternating chapters Marshall examines Bishop's peripatetic, often alcohol-fueled, life, and connects it to her own memories of the Harvard literary landscape of the 1970s. The chapters on Bishop are the more interesting ones. The poet led a colorful life as a Nova Scotian transplanted to Brazil and the United States, a lesbian who often enmeshed herself in love triangles and quadrilaterals, and as the creator of a slender but influential body of work. I did not like the writing style employed in this book, and I found myself skimming the text more than I would have preferred. For example, Marshall frequently mentions Bishop's drinking binges and resulting hospitalizations, but her placement of this information in the middle of paragraphs that go on to discuss other things downplays the seriousness of Bishop's addiction.